Location: Amsterdam, Where Fire Is Called "Vlam"
My character Fire's name seems to have created a challenge for almost all of my translations so far -- for a bunch of reasons, but most often because the direct translation of the word "fire" tends to be masculine. The Italian word for "fire" is the masculine "fuoco." The Italians kept Fire's name as Fire -- but flipping through a copy, I noticed that Archer is named Arciere, the Italian word for "archer." I like it! 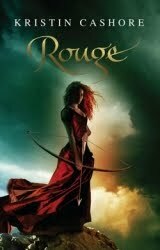 In French, the word "fire" would be pronounced like "fear," more or less, which isn't a very nice name, and the French word for "fire" is "feu," which isn't a nice name, either, and is masculine.... so the French renamed Fire, and the book itself, Rouge. Makes sense... but a few things are lost. 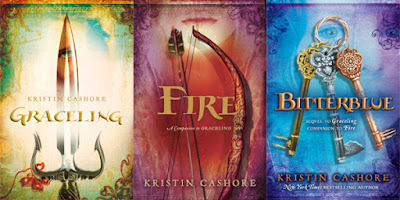 Primarily, the explicit connection between the character Fire and all the references to actual fire -- flames -- in the book. I just got my Dutch version of Fire. I don't have a cover to show you yet, but the title is Verraad in de Dalen, which means something along the lines of "Betrayal in the Dells" (which I'm certain sounds less silly in Dutch than it does in English). In the Dutch version, we have my favorite translation of Fire's name yet: "Vlam." Flame! And Archer's name, if I'm reading the book right, is Schutter. I haven't had a chance to look through the Spanish version yet, but it's called Fuego (the Spanish word for "fire"). I don't know what Fire's name is -- presumably not Fuego, since that's a masculine word. And that's the news from here. Here being Amsterdam, incidentally, where I'm up to my eyeballs with interviews, but hope to have some time to explore. Today, flying in, I saw gigantic windmills rising out of the North Sea. Later on, I saw windmills on land. It reminded me of the debates in the US whenever a wind farm is being proposed. People want the wind farms to be built offshore, where no one can see them, because "windmills are ugly." I have never understood this attitude. Windmills are beautiful. They're enormous, graceful creatures, and they harness the wind, which is a beautiful thing to do. I wonder, have these people ever *seen* a windmill? Get with the program, people!!! !